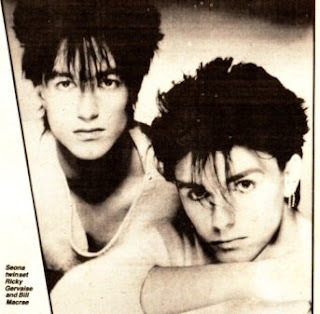 We dove back into a little more obscurity this week on Talking 80s Music as we focused on U.K. new romantic duo Seona Dancing. If you are scratching your head, it's alright. They only released a pair of charting singles but, as always, there's more to the story. You see, vocalist Ricky Gervais didn't wind up becoming lost to time. You most likely have seen his films, television series or stand up comedy. If anything, he's a little embarrassed by it all (as you can see in the YouTube video we post below.) We played the songs "More To Lose," "You're On My Side" and a remix of "Bitter Heart" during the show.